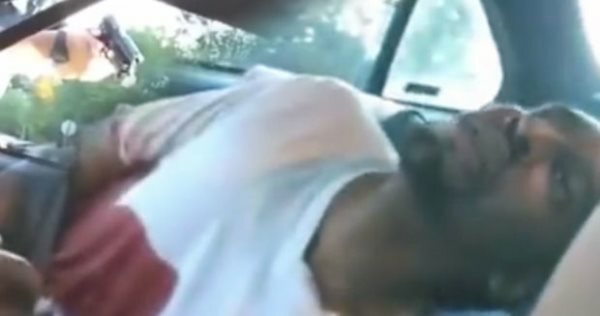 Philando Castile as he lay dying at the hands of a white race soldier. “F*ck!” the thug cop shouted while continuing to point his gun inside the car. “Get the female passenger out!” the gun-wielding race soldier commanded. According to Reynolds, the police pulled them over for an alleged broken tail light and callously shot her boyfriend, Philando Castile, to death after he told the officers that he had a firearm and a conceal-and-carry permit. Reynold’s 4-year-old daughter was reportedly sitting in the backseat when the officer fired at least four bullets into Castile’s arm and chest. Although the Minnesota Bureau of Criminal Apprehension has launched an investigation into the recent shooting, over 100 people gathered at the crime scene last night demanding to know why Castile was shot to death over an alleged broken tail light. Castile would have turned 33 on Friday.